The classic 4th of July BBQ is a day with family and friends, eating simple American food, celebrating our country, and lots of red, white, and blue. Independence day celebrations happen throughout neighborhoods and cities across America, and whether a child or adult, we all look forward to this yearly holiday where we can unwind and enjoy a weekend full of festive activities with loved ones. July 4th is a day full of tradition that falls in the middle of the lazy days of summer. But as hot as the weather may be, there's no need to sweat the menu—or decorations, for that matter. Here are some tips for making an Independence Day cookout that you and your guests will enjoy. Don't be afraid to put together a really simple menu for your party. It's usually humid, hot, and muggy on the holiday so if you are hosting the party outside, stick with a low-fuss menu, like the one suggested below. It is also a good idea to delegate some responsibilities so you are not running around sweating it out. Assign a grill master for the day—there is always someone who loves to be behind the grill cooking, flipping burgers and rolling hot dogs. You may also want to consider asking someone to keep an eye on ice and drinks—when it's hot outside there is nothing worse than running short on ice cold beverages for your party goers. You probably know what to serve at a classic barbecue, but did you know you can arrange the food so your guests do a lot of the work? Set up a build your own burger bar, a nacho table, or an ice cream sundae station. This way, you are really only responsible for the ingredients, but not for assembling everything. And have fun with your set-up—there are so many great burger and hot dog toppings out there, feel free to be creative! And of course when a guest asks "What can I bring?" take them up on their offer! Have some people bring side dishes and others bring desserts. Just keep track of the food so you don't have a table full of potato salads. July 4th could be one of the easiest holidays to decorate for. Ahead of time, pick up red, white, and blue paper plates, napkins, and cups, as well as some disposable flatware. Also, grab plenty of miniature American flags--they look great in Mason jars and glass flower vases. (If you want to get a little fancy add white hydrangea or red Gerber daisies to the jars.) Place all of this on tables covered in white cloths and you've got a festive decor without much effort! Everyone loves to begin a party with some appetizers, and chips and dips are the simplest way to go—especially if you serve store-bought dips (or have friends bring their favorites). Fill big bowls with potato chips, tortilla chips, and pretzels, and smaller bowls with a variety of dips. Then place everything on one big tray, or a few smaller trays, and let guests mix and match chips to dips. Since Independence Day is a time to celebrate the good ol' US of A, it's the perfect occasion to feature all (or some) of our American favorites. This menu is just a suggestion—use it as inspiration when planning your July 4th BBQ. Grilled corn on the cob: From spicy rubs to herb butters to Mexican street corn, there are so many delicious ways to dress up an ear of grilled corn. Choose a recipe you think your guests will love or set up a variety of toppings they can put on the corn themselves. Burgers and Dogs: Your guests may expect these ubiquitous American cookout foods, but you can still surprise them by making them a little special, like the to-die-for burgers and Lewis' Coney Island hot dogs. Barbecue ribs: Bring a bit of the South to your cookout with fall-off-the-bone, finger-licking barbecue ribs. No one will be able to resist. Side dishes: What would a barbecue be without potato salad? And bring a bit of healthy green to the buffet table with this make-ahead spinach salad. Desserts: Take the ice cream sundae to the next level with these brownie sundaes with banana chips. 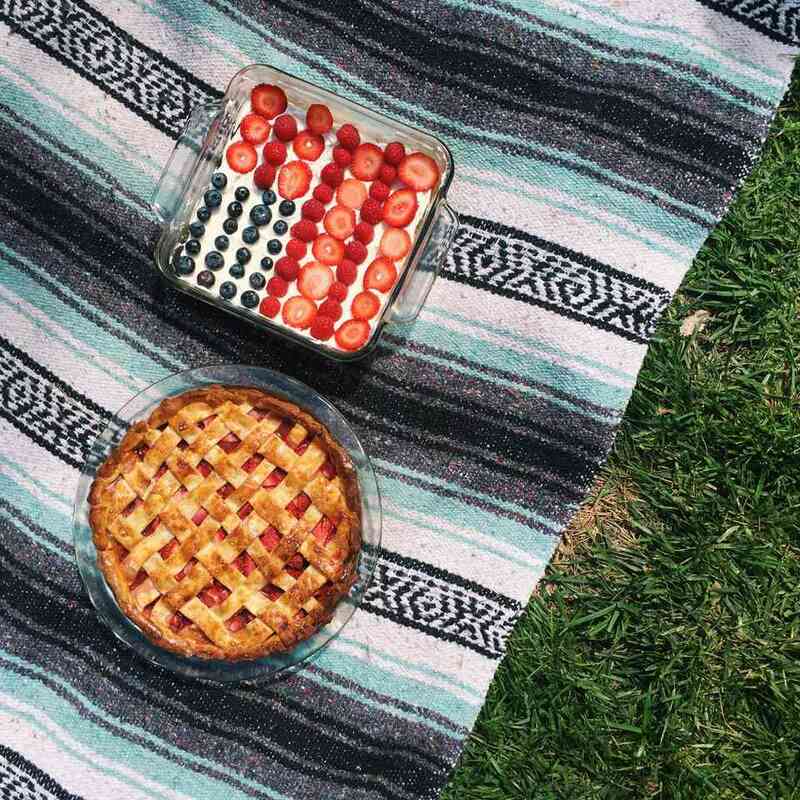 And what is more American than pie? This blueberry pie with lemon pastry will keep your patriotic theme going until the end. A classic 4th of July BBQ is best when you have good friends, good food, and good fun. Don't forget what's important when you celebrate this special day—try to relax and spend time with your guests to create memories to share for years to come. Planning in advance will make sure the day goes smoothly and that everyone has a good time—including you!